Magnet #72 - Keith Haring, maybe. So, this little red guy was part of a pair that a friend brought back, from (I think) Detroit. The blue one's at home, and his little feets double as a keychain holder. Heh. I want to say these are Keith Haring guys, but couldn't find them when I looked it up. I ended up using this one at work, to hold a couple of pins that I picked up along the way. 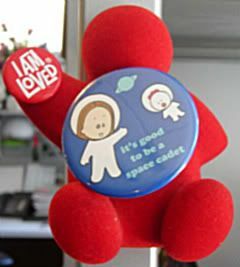 The "It's good to be a space cadet" pin is Deborah, the "loopy Latina" from the Angry Little Girls collection. Yeah, I'm not sure whether or not to be offended by it, either. But, it's cute, nonetheless. The "I Am Loved" pin was from a new biz pitch to Helzberg Diamonds...apparently, with every purchase in their little burgundy boxes, they give this pin away, too. It's kinda sweet. Of course, absolutely going for broke (literally) to get the full purchase experience, I ended up buying myself a white gold necklace from our store field trip. Yeah, I try not to bring my wallet on new biz field trips any more.